Following the success of ADA, it was decided to build in the Frascati National Laboratory a storage ring of the same kind, with larger top energy and intensity, with the aim of exploring the new energy range in subnuclear physics opened by the possibility of observing particle-antiparticle interactions with center of mass at rest. The construction of the new machine began in 1963: a 350 MeV Linac, built by Varian (USA), was used as an electron and positron injector. This machine was capable of delivering high current (~100 mA) electron pulses of 4 µ s length at a frequency ranging from 1 to 250 pulses per second: in order to produce a positron beam a tungsten target could be inserted in the beam line to stop the electron beam after the first four high current accelerating sections (~4 A at an energy between 60 and 80 MeV): positrons were created by bremsstrahlung and pair production in the target, with an efficiency of ~0.1%. The 1.5 GeV per beam, 105 m long storage ring is divided into 12 equal cells, each one consisting of a bending magnet with a quadrupole doublet and a half straight section on each side. The free space in the straights available for the experiments was ~2.5 m. Four radiofrequency cavities, running on the third harmonic of the revolution period (350 ns) delivered a total accelerating voltage of 120 KV. An adiabatic closed orbit deformation obtained with by a couple of pulsed coils inside the vacuum vessel allowed multiturn injection of the long pulses coming from the Linac through a short transfer line. Three electron bunches crossed the corresponding positron ones in 6 out of the 12 available straight sections. Two of them were occupied by the R.F. cavities, the other 4 could host the experimental setups which were able to observe the electron-positron interactions at the same time. The 6 non crossing sections were used for injection and diagnostic equipment. The luminosity of the collider was measured by detecting the rate of electron-positron small angle scattering, single and double beam-beam bremsstrahlung. The first electron beam was stored at the end of 1967. The first positron injections immediately put in evidence a new kind of instability, the "head-tail" effect, which inhibited the storage of the required positron intensity. In parallel to the theoretical explanation of this effect a feed-back system, picking up the position of the beam and providing proper action on the beam by means of variable electromagnetic fields, was implemented on the ring, allowing the storage of the design electron and positron current and the achievement of the design luminosity of 3x10^29 cm^-2 s^-1 per crossing. The first generation experiments, and successively the second generation ones, explored the physics of electron-positron collisions up to 3.0 GeV in the center of mass, from 1969 to 1978. After that time, the storage ring was deeply modified, in order to be used with the electron beam as a source of synchrotron radiation (PULS, PWA) and of monochromatic, intermediate energy gamma-ray beams for nuclear physics (LADON) obtained by colliding the electron beam with a laser. The main changes in the storage ring structure were a new single radiofrequency cavity, running at 51 MHz on the 18-th harmonic of the revolution period and the replacement of the vacuum vessel with the introduction of a distributed system of detection and correction of the beam position, in order to accurately control the source points for the beam lines. Still for nuclear physics experiments, an internal gas target (JET TARGET) was realised in 1988: it consisted of an Argon (and successively other gases) beam shot at the velocity of sound at right angle on the electron beam, producing an intense gamma-ray beam. Finally, in 1991, electron-positron operation was resumed to study neutron-antineutron production and measure the nucleon form factors (FENICE experiment). The beam from the Linac was also used directly for nuclear physics experiment (LEALE). ADONE was shut down on April 26, 1993 to allow the construction of a new low energy, high luminosity collider, DAFNE, inside its building: Prof. Giorgio Salvini, the first Director of the Frascati National Laboratory switched off the last stored beam, after 24 years of operation, during which ~22000 hours of colliding beam and ~5300 hours of single beams had been delivered to the experiments. The experimental activity on ADONE with colliding beams began in 1969 with four experiments, run by groups from several italian institutions, with the aim of studying many aspects of the electron-positron interactions, such as the test of quantum electrodynamics predictions, the search for new vector mesons and leptons heavier than the electron and the muon, the measurement of the production rates of muon pairs and hadrons. The "Gamma-Gamma" Experiment (with researchers from Frascati and Rome) had, as a principal goal, the detailed study of reactions with neutral particles in the final state. Its experimental setup included scintillator counters following lead plates for the conversion of the photons and spark chambers to show the produced showers. The "Mu-Pion" Experiment (Frascati, Rome, Padua) was mainly dedicated to production of muon, pion and K meson pairs from the electron-positron annihilation. The setup consisted of scintillation counters, spark chambers seen from above by means of characteristic long mirrors and water Cerenkov counters to separate the pions from K mesons. Large iron shields interleaved to the spark chambers allowed muon identification. Flash tube chambers were also part of the detection system. A schematic representation of an event with 5 hadrons in the final state observed by the "Mu-Pion" experiment. Scintillation counters appear in blue colour, the iron absorbers are brown, and the grey ones are lead. Particle tracks in spark chambers are shown in red. The "Boson" Experiment , run by physicists from Frascati, Naples, Pavia and Rome, employed a very compact setup, made of scintillators and wire magnetostrictive chambers, well suited to detect charged particle final states under the maximum solid angle. Its place on the interaction straight section was later taken by the "proton-antiproton" experiment (designed and run by a group from Naples) dedicated to the study of proton-antiproton production at threshold. The setup was made by scintillation counters and large gap optical chambers. The main goals of the BCF (Bologna, CERN, Frascati) were the measurement of the pion and K mesons form factors, and the search for heavy leptons. Particular care had been paid to the calibration of the detectors, in order to guarantee a good particle identification by a system scintillation counters and spark chambers. First measurement of electron-positron -> proton-antiproton cross section Limits to the new lepton mass from the BCF experiment. The low energy of ADONE did not allow the discovery of the tau lepton. The experiments at ADONE produced immediately an unexpected and very important result, which became one of the main justifications in favour of the theories based on quarks as the point-like components of hadrons, the strong-interacting particles. It was observed that electron-positron collisions produced hadronic particles at a very large rate, even larger than the rate of muon pairs, which should instead be larger if nucleons and mesons were point-like themselves, not composed by other elementary sub-particles. 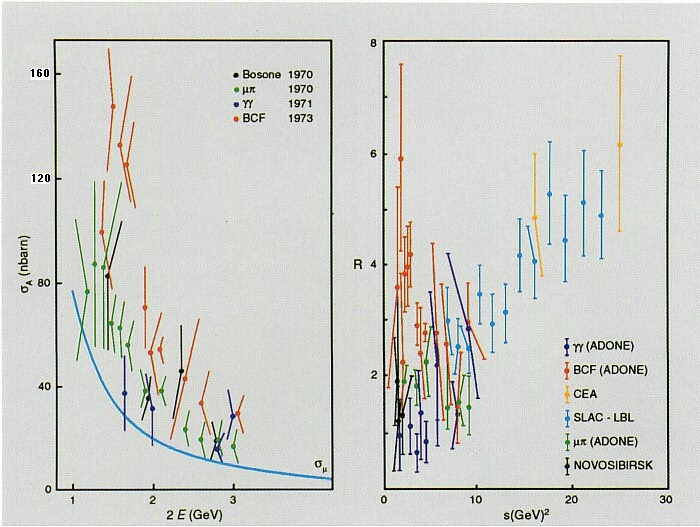 Multihadron production results obtained in Frascati from 1969 to 1974 (left plot): the blue line shows the muon pair production cross section. The right plot shows world data on R (multihadron to muon production rate) up to 1974. The first evidence of an anomalous multiple production came in 1970 from the measurements of the "boson" experiment. It was not demonstrated that it was due to hadrons, but it was clear that in the electron-positron collisions something happened at a rate and behaviour which could not be explained by the known quantum electrodynamics. In fact, in a single electron-positron interaction, three or more charged and neutral particles were produced at a rate larger than any prediction. The proof that the outcoming particles were hadrons was obtained from the observation of their interactions in the absorbers, since muons undergo a very small amount of nuclear interactions. The final demonstration came in 1971 from the BCF group. The first interpretation of the experimental results from ADONE with a three quark model showed up to be not sufficient. The ratio R between the rate of electron-positron going into hadrons and muon pair production yields a direct measurement of the number of quark-antiquark pairs of mass smaller than that available from the electron-positron annihilation, and coincides with the sum of the charges of any kind of existing quark. The value of R, in the three quark model, could reach 2/3, while the observed value was clearly larger, around 2. This value is consistent with the assumption that the quarks have a new degree of freedom, a peculiar characteristic called "colour", which is the basis of the present theory of their interactions, quantum chromodynamics. The experimental result from ADONE was an important contribution to the development of this theory. With the discovery of multiple production at ADONE, electron-positron physics became immediately the field of maximum interest in sub-nuclear physics, thus encouraging the construction of a large family of high energy electron-positron colliders all over the world. Other important results, at least partially unexpected, came from the first generation of experiments at ADONE. First of all, the predictions of quantum electrodynamics in purely electromagnetic reactions were confirmed within the explored energy range, demonstrating in particular the point-like nature of electrons and muons. Photon-photon interactions were clearly identified for the first time through the cinematic reconstruction of events with 4 electrons in the final state. In addition to the three already discovered (rho, omega and phi), the first evidence of the rho (1600) vector meson was found and the first measurement of the production rate of barionic matter and antimatter was performed. Finally, a lower limit to the mass of new leptons could be fixed, having excluded their existence in the explored energy range with a very high confidence level. The heavy lepton tau (1784 MeV) was discovered at SPEAR (Stanford) in 1975. The results of the experiments at ADONE stressed the limits of the first generation detectors, designed under the assumption, immediately contradicted by the observations, that only few particles could be found in the final states of electron-positron annihilation. The great interest towards the study of electron-positron collisions arisen from the first results required improvements both in the storage ring operation and the development of new and more complex detectors, taking into account the most recent technological developments in the particle detector field. In particular, the requirement of a complete analysis of the final states particle properties asked for a detector placed in a magnetic field to discriminate the charge and measure the particle momentum. In order to fulfil this requirement, researchers from Frascati, Naples, Padua and Rome realised MEA (Magnete Esperienze Adone), a detector made of large gap chambers and spark chambers, placed inside a large solenoidal magnet. The Gamma-Gamma 2 Experiment was the natural development of the Gamma-Gamma Detector (scintillation counters, converters and spark chambers), covering a larger solid angle with a better sampling of electromagnetic and hadronic showers. The Baryon-Antibaryon Experiment was designed to study proton-antiproton and, more generally, any baryon-antibaryon pair, similar to protons, but with a larger mass, looking mainly at the energy threshold of the reaction. The detector consisted in large liquid scintillators, wire chambers with magnetostrictive reading and flash tube chambers. The experiment was realised by a collaboration between Frascati, Naples, Pisa and Istituto Superiore di Sanita'. In November 1974 the field of subnuclear physics was deeply upset by the discovery of a new, completely unexpected particle, characterised by an extraordinary stability for its large mass, ~3.1 GeV. The particle was discovered at the same time at the electron-positron storage ring SPEAR at Stanford (where it was called "psi") and at the proton synchrotron of the Brookhaven National Laboratory, near New York, where it was called J. The energy in the center of mass needed to produce the new particle was only ~0.1 GeV above the nominal operating energy of ADONE: this explains why it was not discovered before at ADONE. However, it was decided to push the performance of the machine beyond its standard parameters, in the energy range indicated by the american laboratories. After three days the signal of the new particle appeared in an extremely clear way, as a very high cross section within a so small width, that it was completely hidden by the intrinsic energy spread of the particles interacting in the collider. 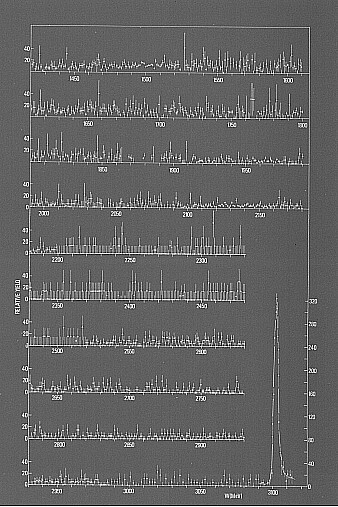 The second generation detectors at ADONE had unique features to identify some peculiar aspects of the new particle, and in this way they were able to give significant contributions to the measurement of its properties. In addition, it was decided to scan the whole energy range of ADONE in small steps (1 MeV) to look for the existence of other narrow resonances of lower energy. The importance of the J/psi discovery lies in the fact that it is the proof of the existence, in addition to the already known three quarks, of a new type of quark, currently called "charm", which represents a new class of fundamental constituents of matter. Its existence was already foreseen in 1970 by Sheldon Glashow, John Iliopulos and Luciano Maiani, in order to include the behaviour of the quarks within a unified theory of electromagnetic and weak forces, and explain in a very elegant way the absence of some weak decays of strange particles. The synchrotron radiation has been used for the first time in the early sixties at the Frascati Electron Synchrotron for research in the field of solid state physics. After those first pioneering experiments, in 1978, a systematic utilisation of the synchrotron radiation from ADONE, emitted at high intensity and short pulses on a spectrum extending from the ultraviolet to soft X-rays, was started. The light was separated in several bands of well defined wavelength, concentrated by means of mirror systems and directed towards the PULS (Progetto Utilizzo Luce di Sincrotrone) laboratory, where it was used to perform experiments in the fields of atomic and molecular spectroscopy, materials structure, semiconductor properties, photochemistry and biophysics. Because of the high "brilliance" of the machine (the number of photons per second emitted by the beam per unit source surface and per unit solid angle), it was possible to realise an intense source of X-rays with an energy between 3 and 30 KeV, for a large research program in several research and technology fields, called PWA (Progetto Wiggler Adone). The experimental activity of PWA started in 1980 with a series of experiments of atomic absorption spectroscopy in a wide energy spectrum and of atomic structure analysis. The X fluorescence induced by the synchrotron radiation allows the identification of elements present inside a given specimen at a density of the order of one part per million: this kind of analysis has been widely used in PWA for industrial applications, medicine, environment control, study of artistic pieces and dating. The X fluorescence technique enables also the simultaneous analysis of different chemical elements in the specimen under observation. The Jet Target installed on ADONE for the production of a gamma-ray beam to be utilised in nuclear physics experiments: the upper cone contains the injection system of the argon jet, which crosses the electron beam in the central interaction chamber and is recovered in the lower cone. An electron accelerator can produce a photon beam by decelerating the electrons by means of a target inside the ring. A recent technique, called Jet Target, delivers photon beams of adjustable and well defined energy without destroying the electron beam and with no harm to the ultravacuum environment of the accelerator vacuum vessel. The Jet Target installed on ADONE in 1990 provided collisions between the stored electrons and a thin gas jet of Argon to generate the reaction e + Ar -> e + Ar + gamma , where the electron loses energy emitting a photon. The energy of the emitted photon can be measured accurately by precisely detecting the energy lost by the electron (this technique is called "tagging"). With this facility monochromatic photon beams have been produced with high intensity (up to 7x105 tagged photons per second) in the energy range from 0.2 to 1.2 GeV, which have been exploited for a large variety of measurements on photonuclear absorption on light and heavy nuclei (up to U238) and on the production of neutral particles (gamma, neutral pion) in the photon-nucleus interaction. These experiments yield information on the influence of nuclear matter on the intrinsic properties of the nucleons and on the hadronic nature of virtual photons. Researchers from Frascati, Genoa and Istituto Superiore di Sanita' collaborated in this research program. Another research line was the study of quasi-deuton reactions in intermediate nuclei such as silicon, and photofission reactions in heavy nuclei. The LADON group hosted researchers and technicians from Frascati, the two Universities in Rome, Istituto Superiore di Sanita' and their associated INFN sections. The experience gained at ADONE is now being exploited at Brookhaven and at ESRF in Grenoble, by performing experiments which extrapolate to much larger energies (0.2÷ 2.0 GeV) the techniques developed in Frascati. In 1990, after several years dedicated to single beam operation for synchrotron radiation and nuclear physics, two beam operation with electrons and positrons was resumed to perform the last subnuclear physics experiment, FENICE, whose data taking lasted until the final shutdown of ADONE in 1993. The FENICE experiment's goal is to overcome a gap in our knowledge about the internal structure of the neutron, by measuring its electromagnetic form factor through the reaction electron + positron -> neutron + antineutron. The results of such a measurement, never done before, together with the existing data on the reaction electron + positron -> proton + antiproton yield one of the essential experimental backgrounds for the most modern theories based on the quark structure of the proton and the neutron.